For months, book lovers in America and Canada have been asking their family members and friends returning from Europe to bring them a DVD of the hit film The Girl with the Dragon Tattoo, and the third book in the Millennium Trilogy by author Stieg Larrson. Now, the film is going to open in America, starting with a handful of cities on Friday. 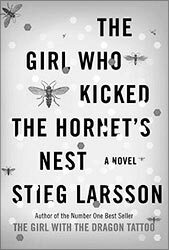 The novel, The Girl Who Kicked the Hornet's Nest, will be published by Knopf in May. And the connoisseurs are for a treat. Even if you have a DVD version of the first novel in the series, see the film on the big screen to savour the experience. A thriller based on Larsson's international best-selling novel about a disgraced journalist and a troubled young female hacker who investigate the disappearance of an industrialist's niece, The Girl with the Dragon Tattoo became an award-winning hit in Europe over a year ago. In Europe alone, the Swedish movie sold about 10 million tickets and became a bigger success on DVD and Blu-ray. As directed by Niels Arden Oplev, it distills the essence of a 500-page long cautionary tale about the hidden criminal and fascistic agendas hiding in even the seemingly progressive societies -- in this case Sweden. Larsson died unexpectedly in 2004 at age 50. Now, this atmospheric and socially conscious Swedish film, with a superb performance by Naomi Repace, is emerging as a thinking man's thriller in North American theatres. Based on a book of the same name by Larsson, the radical journalist, anti-neo Nazi crusader and social critic, it jolts and surprises even those who have devoured the book slowly. Harriet Vanger disappeared 40 years ago from a family gathering on the Swedish island owned and inhabited by the powerful Vanger family. Her body was never found but her uncle is convinced she was murdered by a member of the tightly-knit but also very troubled family. He employs financial journalist Mikael Blomkvist (Michael Nyqvist) and the tattooed, unconventional but ever-resourceful computer hacker Lisbeth Salander (Noomi Rapace) to investigate. The pair suspect Harriet's disappearance is linked to several grotesque murders over the past four decades. But finding out more about the Vanger's secrets is a perilous task. The imminent arrival of the film has led to big stories about the author and the film in major American publications. 'Americans are big on discovery. We like being the 'finders' of all good things -- like Google and apple pie and baseball...but in the case of The Girl With the Dragon Tattoo, we were not the first,' wrote John Anderson in The New York Times. Hollywood, never one to pass an opportunity to remake a solid hit from abroad, is reportedly mulling an English version of the film with Carey Mulligan, the Oscar-nominated star of An Education playing Lisbeth Salander, reports the British publication Empire. The Hollywood version may surprise the viewers but see the original first, and admire the powers of a director, team of actors, and an editor to surprise even those who have read the book couple of times. The film is darker and more brutal than the book, but its violence is at the service of the plot and the message it wants to convey. In the press notes for the movie, Oplev says many people have asked him if he felt honoured to be chosen to direct the feature film. He confesses when he was offered the project, at first he kept saying No, mainly because he was directing TV films that had to be made first. But when The Girl... was postponed and Oplev was approached again, he began reading the book. He wanted a film with strong emotions, strong characters and a controversial and intriguing story and this book had it all, he continues. 'The actors must have the shine of the character,' he continues. 'The Swedish actor Michael Nyqvist presents us with the humanity, empathy and intellectual strength, which we expect from his character Michael Blomkvist. 'Lisbeth Salander is possibly the character in modern Scandinavian drama with the most expectations attached, and I can't believe the luck we had in finding Noomi Rapace for this part. Noomi has transformed herself into her character to a chilling perfection. The prep time was short (about two months) and early on it became clear to him that 'we needed a miracle to bring the film home on time and budget' (about $5 million). 'At that time the Swedish crew came on board, a team that was determined to make a quality film even if it took long days and hard work under tough conditions,' he recalls. The movie has attracted a large number of people who have not read the book; some of whom may even have read it after seeing the film, reports from Europe say. The film grabs our attention so fast that we will hardly notice it is 152 minutes long. What we will remember in the end are not only the haunting images of exploitation, greed and criminality but also the strength of a few people to stand up to evil. The paperback edition of the book has been on The New York Times bestseller list for over 36 weeks; last week it was at Number five. Also on the bestseller list for over 20 weeks is the second book in the series, the hard cover The Girl Who Played with Fire. They are published by Knopf, with its division, Vintage, releasing the paperback.